This recipe for grilled steak and pasta with roasted vegetables is perfect for summer grilling! Good things come when the rain is falling. I bake. I plan. I crave steak and veggies and all kinds of grilled goodies. Chicago was privy to some severe storms the other day and my cooking juices started flowing again. Mr. B. had a hankering for some grilled steak and decided to brave the impending storms to get in front of the grill. I decided to brave the 80 percent humidity (I may or may not be exaggerating) and roast some vegetables in the oven. I found an old copy of Everyday Food – I don’t even know if this magazine exists anymore – in a pile of cookbooks I have been hanging on to. 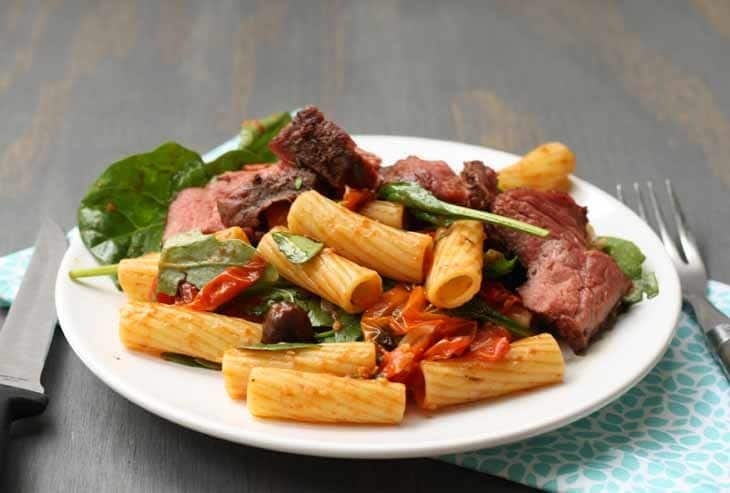 On the front was this recipe for pasta with roasted vegetables and arugula. And you know how I feel about arugula so this had to happen. I don’t often thank Martha, but this is off of one of her recipes… so thanks Martha. I couldn’t leave it as is though. Mr. B. has a silly notion that he must eat meat at every meal and while I’m sad that Meatless Mondays will never take off in our household, its okay. To each his own. 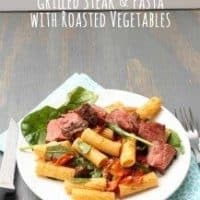 🙂 So grilled steak and pasta with roasted vegetables has been created. I let him pick out some meat at the grocery store – I asked for steak and Mr. B may or may not have gotten beef short ribs. Right animal at least. That’s okay, we tenderized it and it was one of the tastiest pieces of meat I’ve had in a while. Our neighbor stopped by with his two adorable munchkins right after we had finished cooking – the kids didn’t want to touch this but dad sure liked it. Score. We all sat around outside under our blooming apple tree and listened to the rolling thunder of the nearby storm (which thankfully missed us by a mile, literally). It was a really great evening in our little haven in the middle of a big city. I am really looking forward to this summer and feeling a tad poetic. Preheat your oven to 450 degrees. Line a baking sheet with foil. Start to boil water in a large pot. Preheat your grill. 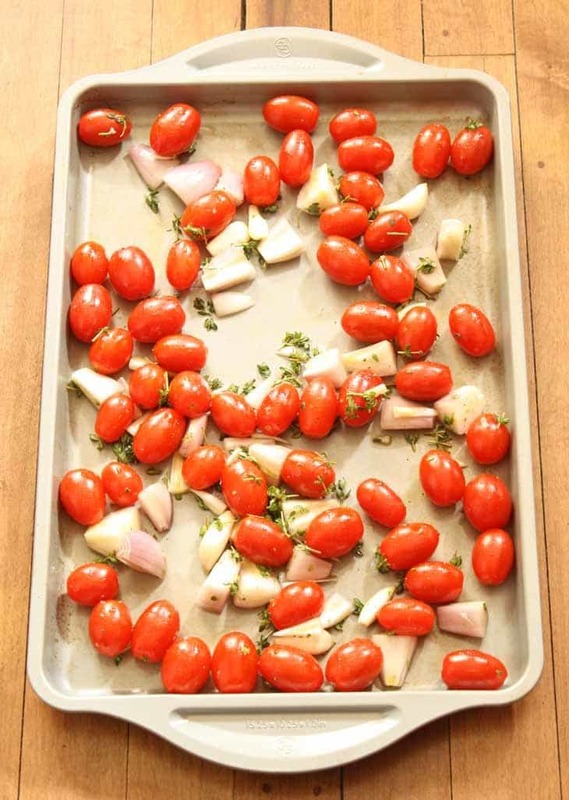 Toss the tomatoes, garlic, shallots and thyme with the oil. Season with salt and pepper and place onto baking sheet. Roast for approximately 20 minutes - until the tomatoes burst. When the water is at a roiling boil, cook the pasta until al dente. Reserve a 1/4 cup of the pasta water and set aside. Drain pasta and return to the pot. 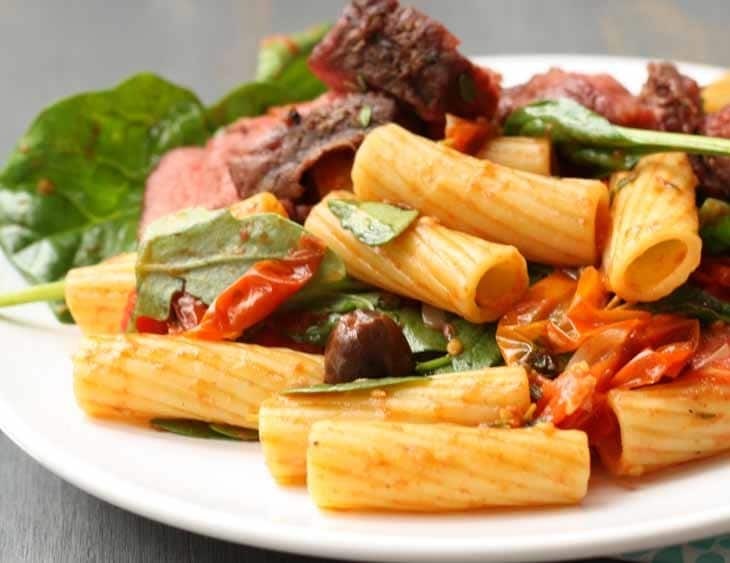 When vegetables are roasted, find the garlic and smash it - then add them to the pasta pot along with the olives and pasta water. Cook on medium until sauce thickens - 3-5 minutes. Stir occasionally. Set aside. Grill your steak - if you need grilling advice, follow the links on this recipe's post. I like mine medium to medium/rare. When the steak is cooked, add the spinach to the pot and stir well. 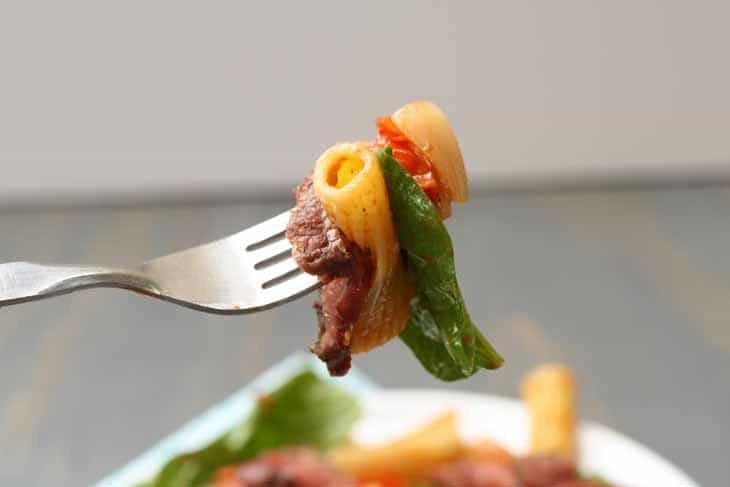 Slice the steak diagonally and portion the pasta onto 4 plates. Place a half of a steak on each plate. Recipe adapted slightly from Everyday Food, January 2010. Here are two websites (website one, website two) to help you grill your steaks – we are not grilling experts, but we are trying to learn. When it gets much warmer, I am going to try roasting the vegetables on the grill instead of in the oven. It gets so darn HOT in the house when the oven is on. I’m thinking of using a roasting pan – it will work perfectly. 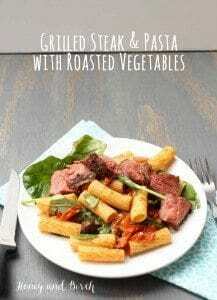 *** If you’re looking for a meatless Monday dish, then just omit the steak.